Blogger Allen Bush has just published a fascinating exchange (“Time to ‘Rethink Pretty’ in the Garden”) he had with Benjamin Vogt, prairie garden designer, activist, and author of the book “A New Garden Ethic: Cultivating Defiant Compassion for an Uncertain Future.” That book is now on my reading list! I have been shrinking the size of my already small front and back lawns steadily over the years, although I’ve been doing that by expanding traditional flowerbeds, adding wildflowers, and creating small groves of understory trees that include native dogwoods. I do still love and plant non-natives, but I try also to plant consciously to attract and support birds, pollinators, butterflies. I inherited a garden full of old, well-established azaleas and have left them, but have started underplanting them with plants like pink evening primrose and native ferns, and adding native azaleas to their numbers. I am fortunate in that I live in an historic neighborhood where every house and garden looks different, and creative gardens are prized. I can think of more than one home where Benjamin’s prairie garden would fit right in! I live in a Southeastern state that is not particularly progressive, but one thing it does very well is to use roadside plantings to cultivate meadow-like swathes of native wildflowers. I appreciate both the beauty and the effort. Susan Rushton reminds us that the Chelsea Flower Shows begins this week! I went for the first and only (so far …) time in 2014. It was such a highlight of all my travels! I would dearly love to go again. In the meantime, I will have to content myself with this beautiful gallery of photos from the Telegraph. Enjoy! I’ve changed my header image to reflect the current season, which seems appropriate for a blog focused on gardening and plants! What do you think? 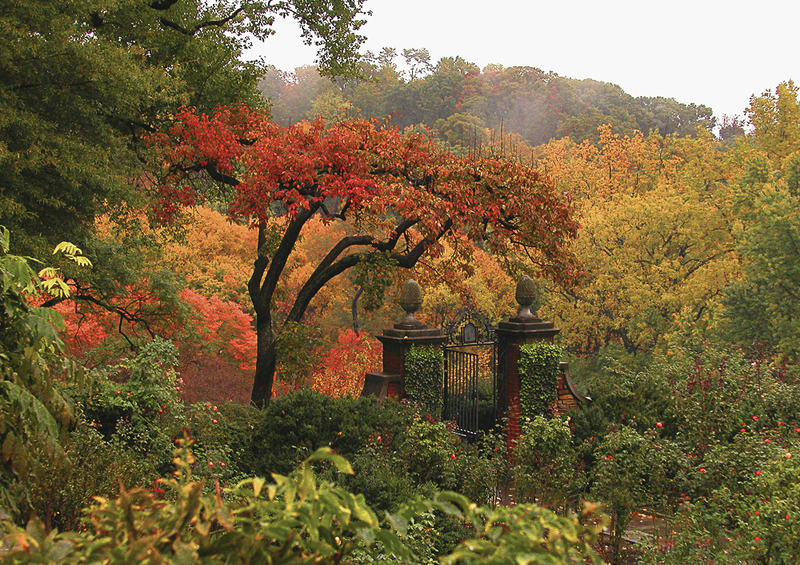 This lovely photo is an autumn view from the rose garden at Dumbarton Oaks. 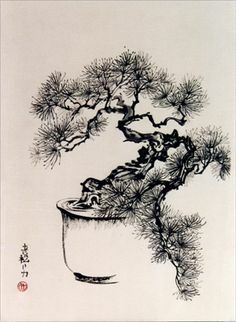 I have been trying to learn the art of bonsai for the last few years (off and on, as it is time-consuming when done well, and I have many other demands on my time). A favorite book is Bonsai Aesthetics: A Practical Guide, by Francois Jeker. One day I asked John Naka if he talked to his trees. He made a look as if he was angry: ‘Who do you take me for? Bonsai has nothing to do with superstition! Of course I don’t speak to them! I think I need to spend more time listening to trees. A child’s garden should be a place where children are allowed to run, play, climb, and freely experience natural materials and bodily sensations. Flowers and berries for picking can be planted in exuberant swaths, with paths made perhaps of yellow bricks winding through their beds. Climbing trees and hiding bushes should camouflage every corner. Miniature forests and meadows can be planted, miniature hills mounded, places for digging and constructing set aside. Rabbit hutches and doghouses should be designed with whimsical flair instead of utilitarian drudge. And water is essential — it is children’s (not to mention adults’) favorite outdoor feature. From A Child’s Garden: Enchanting Outdoor Spaces for Children and Parents, by Molly Dannenmaier. Judy at New England Garden and Thread casually mentioned in a comment on her latest post that she used to take part in the annual Portsmouth Fairy House Tour. How did I not know about this?? Adding this to my bucket list of things to do when next we visit relatives in NH; will have to time visit accordingly! Apparently this tour is the world’s largest fairy houses event. What is a fairy house, you may ask? 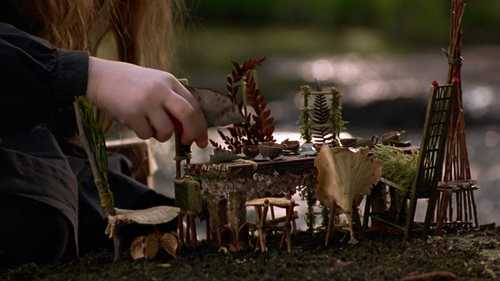 From Tracy Kane at FairyHouses.com: “Fairy Houses are small structures for the fairies and nature’s friends to visit. Sticks, bark, dry grasses, pebbles, shells, feathers, seaweed, pine cones and nuts are just some of the natural materials that can be used. Ranging from simple to intricate ‘Fairy Mansions’, these whimsical habitats are built by children, families, gardeners and nature lovers reflecting their creativity, joy and pride.” Tracy and Barry Kane have written and photographed a charming series of books with ideas for fairy houses, as well as a guidebook for children about making their own. You can find a gallery of their photographs here: FairyHouses.com Photo Gallery. We had a couple of these books when my children were small and we had a lot of fun with them. On a related note, one of our favorite movies has been “FairyTale: A True Story.” It is the film based on the actual incident of two girls who were believed to have taken real-life photos of real fairies in Yorkshire, just after World War I (the “Cottingley Fairies”). They became minor celebrities, promoted by the likes of Sir Arthur Conan Doyle. 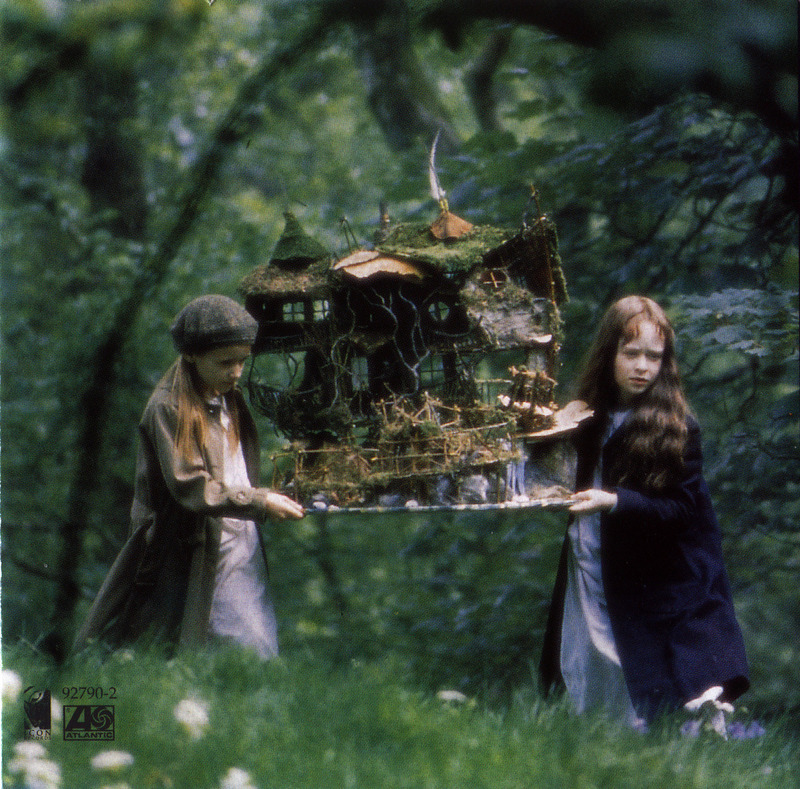 Part of the movie’s story involves elaborate fairy houses built by the deceased, artistic older brother of one of the girls, who died at the age of ten. My children are no longer interested in fairy houses or fairy tales but maybe, as C.S. Lewis once wrote, maybe someday they will be old enough to start reading fairy tales again. I think I’m there. “Earth Goddess” is 25 feet tall and covered with 40,000 annuals. She is integrated into ABG’s Cascades Garden, with some of the water flowing over her outstretched hand. In the winter, during the annual “Garden Lights, Holiday Nights”, she is covered with thousands of shimmering lights. Magic! We recently visited the Bruce Munro installation at the Atlanta Botanical Garden. Oh my. The most spectacular part of it was the “Forest of Light”, an installation of thousands of optic fiber lights in ABG’s Sforza Woods. It was as if clouds of fireflies had settled among the trees. I can’t wait to go back.